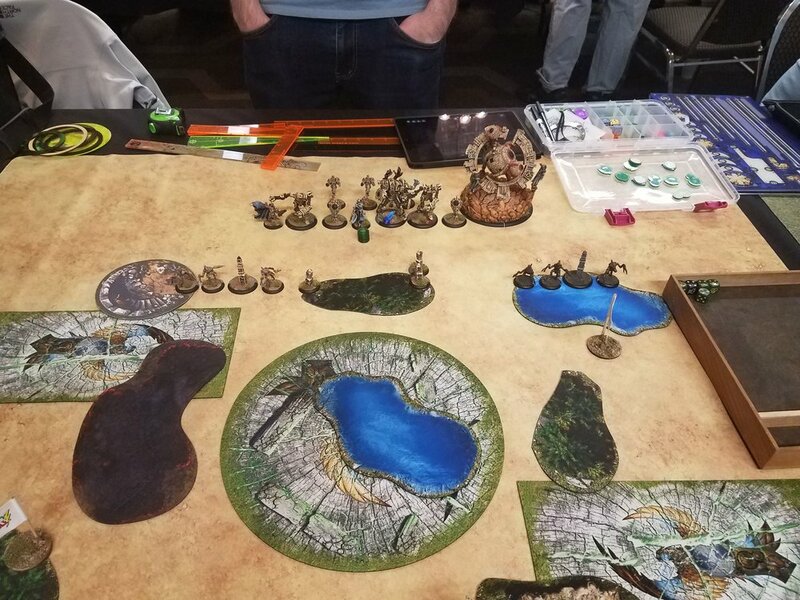 For the final round of ATC, we were paired against the West Coast team, including my friend Adam who I had sat next to on the flight over from Seattle. 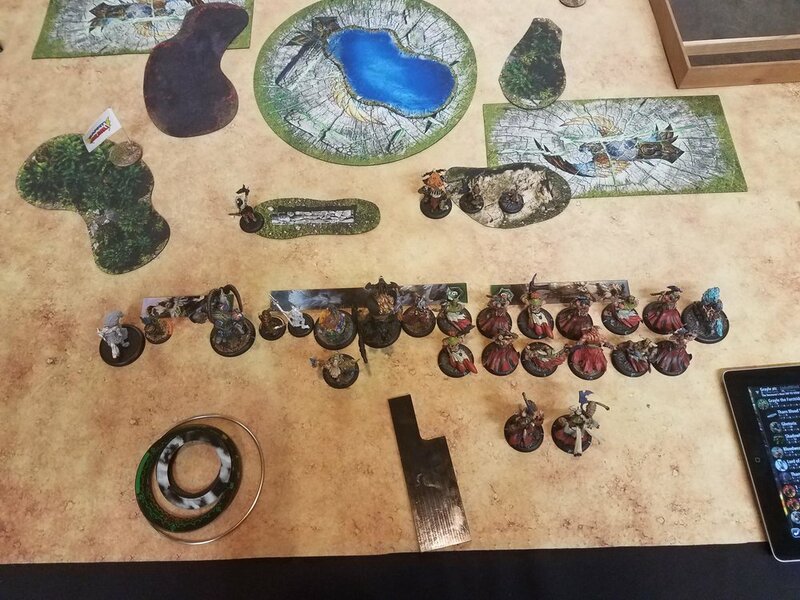 This was the only time we chose matchups, since their team had two Skorne and two Circle, just like us, and then instead of Mercs they had Retribution. We actively wanted to get us the Circle mirrors, and the final scenario was spread the net so our Magnus 2 player was advantaged into basically everything. I ended up playing against Adam, and I figured that with the choice between Una 2 and Krueger 2 on Spread the Net, he would be dropping Krueger. Either way, I was playing Grayle. I won the roll off and opted to go second, taking the side with a really good defensive wall. Going second in this scenario is hugely important when neither side can run 16+ inches turn one. Everything moves up aggressively under Windstorm. At Mox, we play the big burning terrain pieces like forests, but the packet at ATC specifically calls them out as only clouds. After stopping Adam from letting me get an easy turn 1 Sentry Stone, we proceed. I forgot to take a picture for this turn, sorry! I can get a bead on his Woldwyrd, Wayfarer, and Warden with LotF already, so he gets Storm Rager and Puppetmaster and murders the Wyrd, the Wayferer, and dings up the Warden. Everything else moves up and prepares to get shot at. I know that “throwing away” LotF turn one like this is a dubious choice, but I really need those Wyrds off the table so that I can start casting Elusive and Spiny Growth. Adam moves up again, Rebukes a unit of Ravagers and puts up Windstorm. His army moves up beside him, staying outside of 14 inches from Ghetorix with basically everything by an inch or so. Lord of the Feast gets flattened by the Warden on that side. I can easily score three points this turn. His Fulcrum is not contesting the flag on the right, and I can get three Ravagers into the Sentry Stone next to it. Alternatively, I can try and land a boosted Spectral Lash on Krueger and if he moves even an inch I can get Ghetorix into him. I opt to start with that, since it only costs my the Cauldron if it fails, and the Spectral Lash hits and drags Krueger 4 inches. I decide to go all in, and Grayle lands a boosted Gallows to force a transfer. With Feat up, I am able to move Ghetorix and the Shadowhorn and a Ravager into range. 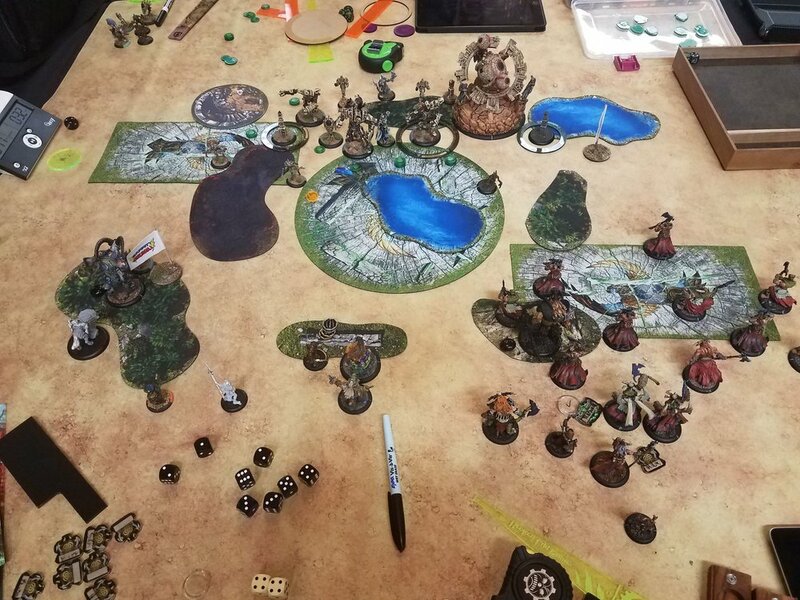 Ghetorix warps Murderous and fails to hit twice, leaving Krueger on two and no transfers. The Ravager unit gets freed from Rebuke by the Nightwitch, and the single Ravager charges in, boosts to hit, and puts Krueger down. Just like my game against Bret in the WMW invitational, forgetting to put the Woldwarden’s animus up gave me this singular chance. I think that if I had not gone for this run, I would have cleared the flag on the right and scored it with my champ, using Ravagers behind the forest as backup. I could have scored my flag with the Gobber Chef, scored my zone with Ghetorix, and contested the top zone with my other Champ. I probably save my feat to counterfeat into the next turn feat, and I keep Grayle 1/2 inch behind the central wall so that I cannot be Telekinesised over it and murdered by things next turn. Seems like a game in that case, but definitely one I’m not guaranteed to win. As for the rest of my team, Chandler, Nathan, and Bret won their games, taking us to 4 - 1 as a team overall and fourth place in the entire event. I’m proud of how our team performed all things considered. This is the third year I’ve gone to ATC, and every year the team’s standing has improved. Who knows, maybe next year we’ll take it down! I think this is a very interesting build with a lot more scenario presence thanks to the Death Wolves, and its results speak for themselves. Thanks again for reading everyone, see you next time!